This item is not returnable once opened. 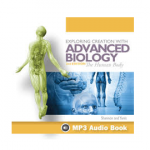 This CD contains a complete audio recording of the course Advanced Biology, The Human Body, 2nd Edition as read by Marissa Leinart. This is the perfect accompaniment to the book for students who are auditory learners, slow readers, or have other learning disabilities that make reading difficult.